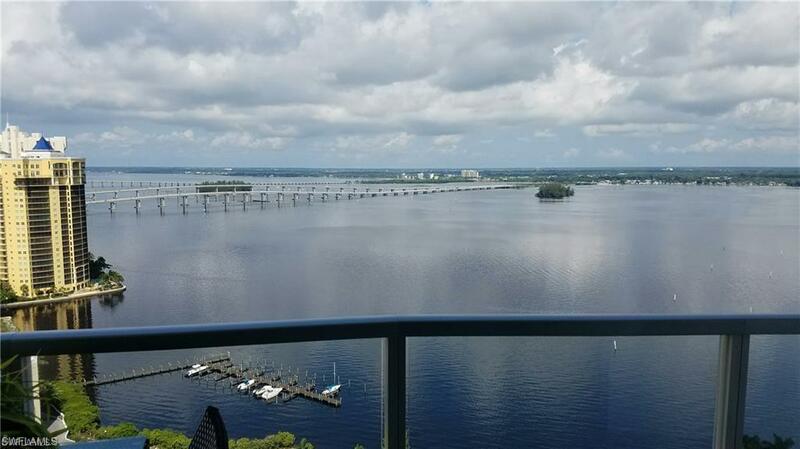 The STUNNING contemporary 32-story tower rises right on the waterfront, with SPECTACULAR river and sunset views from your private balcony overlooking the mile-wide Caloosahatchee River. Enjoy the world class amenities--tennis courts, resort-style pool, state-of-the art fitness center, concierge service, resident only lounge, billiards room and entertaining room. GE monogram and Bosch Appliances. Granite and marble counter tops in kitchen and bathrooms. Floor to ceiling impact windows and glass balcony railings allow for unobstructed and spectacular views! Covered parking in the attached garage. Located near the revitalized Downtown River District with dozens of restaurants, bars, shops and galleries. Near the beaches! CUSTOM DEN BUILT-IN WITH BOOKSHELVES, DESK AND BACK LIT WOOD AND FROSTED GLASS LATTICE WORK! 24" X 24" PREMIUM TILE THROUGHOUT! NEWER AIR CONDITIONER AND NEW WATER HEATER! NEW KITCHEN BACK-SPLASH. NEW CUSTOM CEDAR MASTER CLOSET! NEW LIGHTING FIXTURES THROUGHOUT! SUNSHADES IN ALL ROOMS! NEW CUT STONE ACCENTS IN THE DEN AND KITCHEN AREA AND NEW BASEBOARDS. YOUR PERFECT CONDO IN PARADISE! THIS IS THE ONE! Listing courtesy of Steven Fischer of Jones & Co Realty.